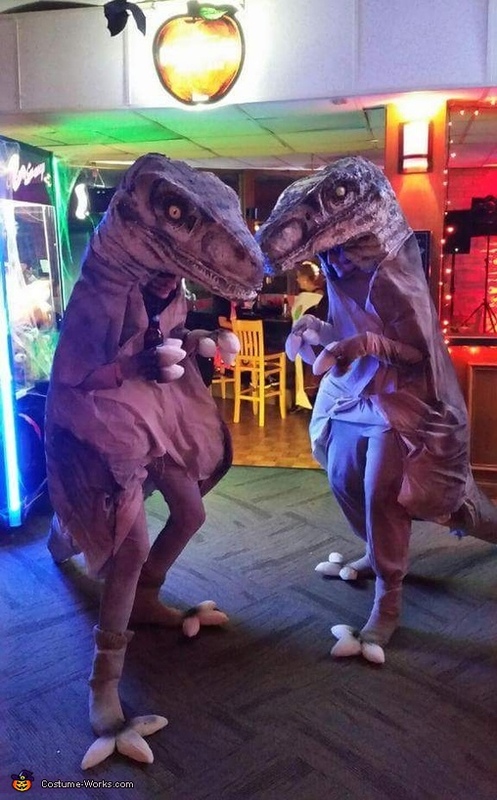 This homemade costume for couples entered our 2016 Halloween Costume Contest. The dinosaurs were my friends idea which I then took farther to the "Jurassic park" theme which had come out that year. She had built the heads with foam blocks cut down and shaped into chicken wire. She then painted the foam head structure with spray paint and later with finer detail. I made the body from a sheet and four pillows. I cut fabric foam down to claws and attached it to gloves and socks. Foam also used rolled for the tail. Rope was used to outline the thigh of the dinosaur. I sprayed painted the rest of the costume and pinned it to my tan colored clothes. We then painted our faces to blend into the neck. We were a hit everywhere we went we won something. We hid and scared countless people, even scared ourselves when we forgot we left the costumes out in the breezeway. Tons of photo ops with people. Drunk people found it hilarious to hump our tails. Sides hurt from laughing at the dance moves from a raptor. The most fun we've had were in these costumes. A lot of hard work went into them but it was way worth it.